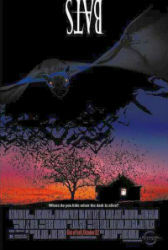 Gallup, Texas is a small town where people seem to be dying from bat attacks. CDC scientists investigate with help from the local sheriff, Kimsey (Lou Diamond Phillips). The bats are unusually smart and aggressive thanks to being genetically modified into intelligent omnivores in hopes of preventing their extinction. The military evacuates the town and gives our heroes only a couple of days to locate the central bat roost and destroy it, or else the town (and hopefully the bats) will be bombed into oblivion. It’s decided to try and trap the bats in a cave and freeze them to death. The military suddenly decides it would like to start blowing things up sooner rather than later. The bats would just like to continue eating people.